this really hurts those mono-mu decks. Danigral - 2 out of 5. This is an interesting card, that ultimately I’m not sure will really do much. It could stall rush one turn at one story. In all likelihood they will just go to another story instead. This will be best with Flooded Vault for surprises, but is it really worth that combo? Another downside: the extra terror won’t go at the beginning with the other terror and combat struggles, which limits the control you can do before the arcane. Since this is a replacement effect, it only checks the moment the investigation struggle begins. Not huge, but worth noting. mnBroncos - 4 out of 5. This is a attach to a story attachment I can really get behind! 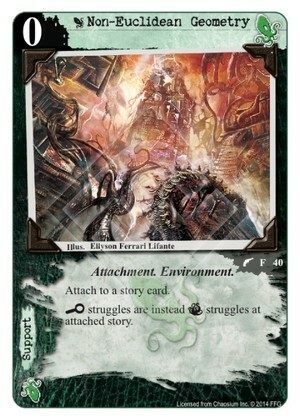 Wow this does so much to help Cthulhu and to really slow down those heavy rush decks that are really powerful right now. Being able to not only remove rushes most important struggle but add a struggle they most likely will lose is so powerful in the current meta. Obtuse - 3 out of 5. I’ve long preached about the dangers of too much math. Anyone who has spent any time in a university math department can likely tell you of a professor that went a little too deep into the numbers and had his brain scrambled. At 0 cost and a nice stall against an opponent packing a lot of investigation this is a great card. livingend - 4 out of 5. The best of the new environments in my book. In part 2 of our reviews I commented that story attachments improve significantly when you can cheat them into play during the story phase and Non-Euclidean Geometry just so happens to share a faction with Flooded Vault. As of now I expect every deck featuring said dank cavern to also be running at least one copy of this. The blowout factor against human factions is massive and even mythos factions can get caught off guard by free (!) additional terror struggles at times. You thought being forced to play around Sword of Y’ha-tallo every time there’s a Vault on the board was bad? Verdict: Math claims another couple hundred victims. Iä, Iä, Iä! WWDrakey & Ire - 3 out of 5. An excellent stall-card for clipping the wings from those do-goody human factions, and replacing it with the horror that only distorted mathematics can evoke. Still, of the Mythos factions Cthulhu isn’t really the one most swimming in Terror icons (*cough* Hastur *cough*), and their Investigate side has also been shored up lately, making this less of a direct fit in most current competitive decks. Still, when you’re building for big Ancient Ones with one domain and need to slow your opponents down… this should be a good option.